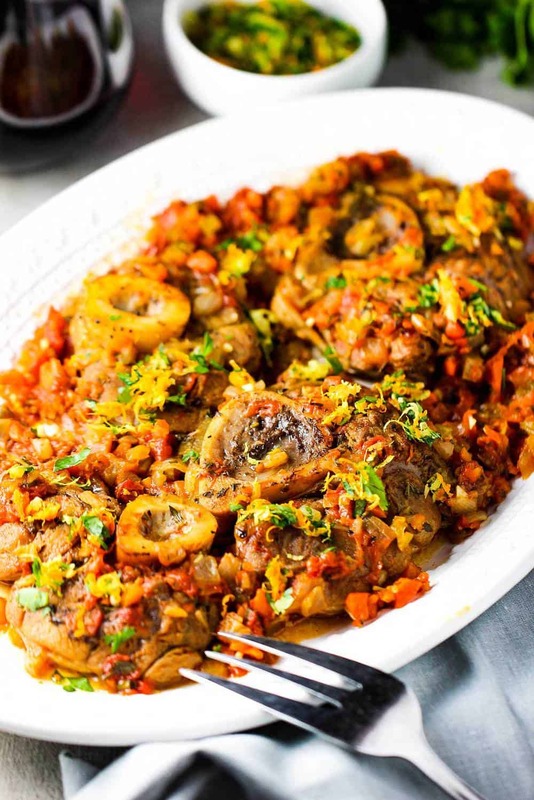 Authentic Osso Buco is one of those ‘special’ dishes for special occasions. There is an amazing hole-in-the-wall Italian restaurant in the Tribeca neighborhood of Manhattan, NYC, that serves the most amazing Osso Buco and we order it every time we go…it’s that good. 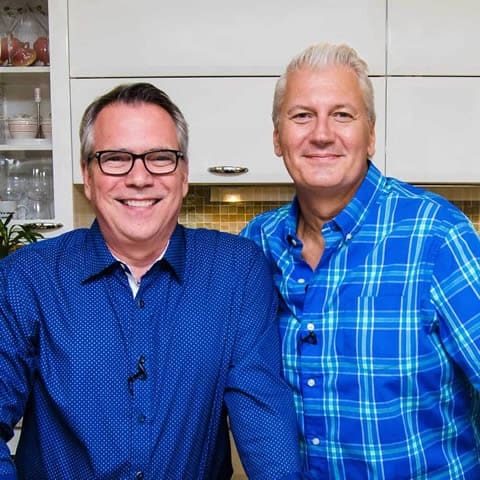 But, making this iconic dish at home really isn’t as daunting as you might think! We promise! 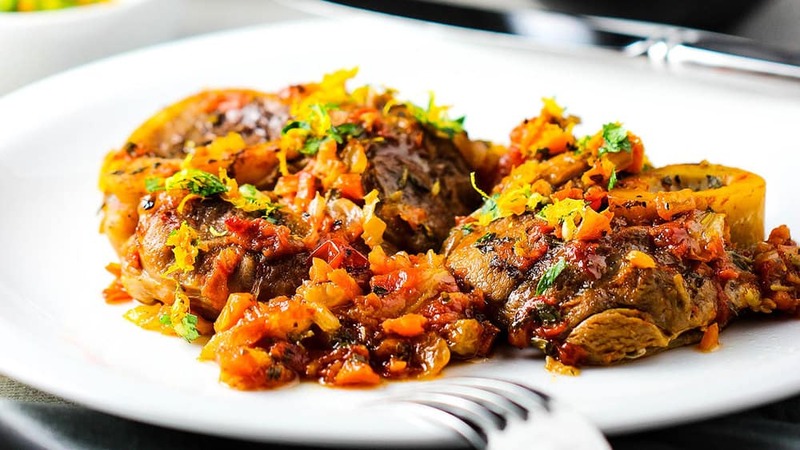 Osso Buco is an Italian dish, originating in Milan, and consists of veal shanks braised in stock, wine and vegetables. In Milan, it is always served with a saffron risotto (coming soon to H2FaL!). 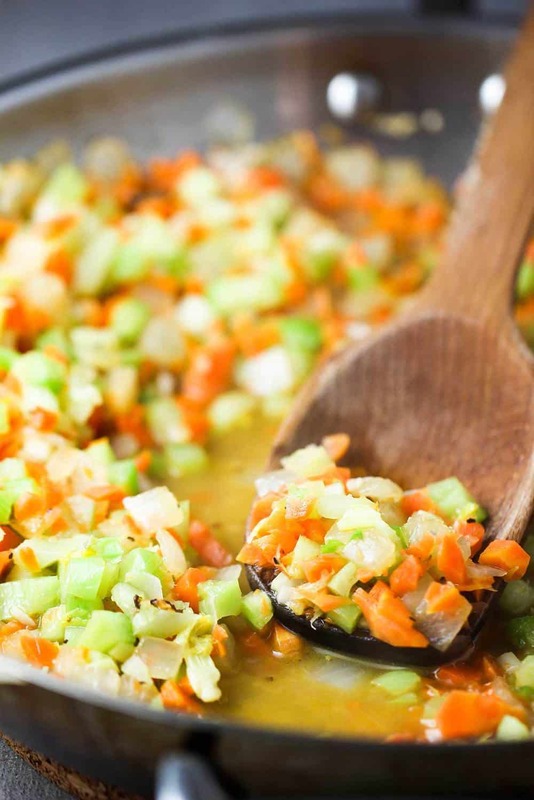 We start by sautéing vegetables that will cook with the shanks in the oven. After the carrots, onions and celery have softened, it’s time to up the flavor with San Marzano tomatoes and fresh herbs. The dish is colorful, gorgeous and equally delicious. Can’t you imagine the smell? So good. We love to use our large Dutch oven to braise the shanks in, but any oven-safe vessel will work. Pour the incredible sauce over the seared shanks. And then cook low and slow, for about 1 hour and 45 minutes. 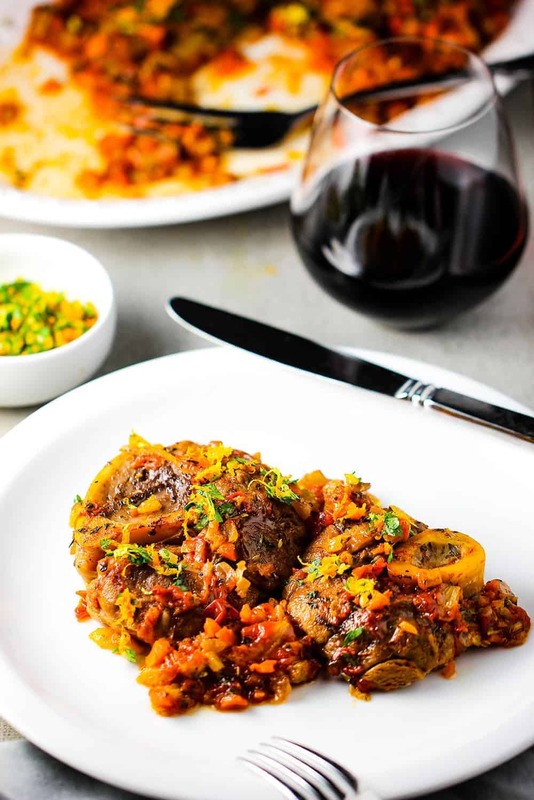 This Authentic Osso Buco is a luxurious dish that is truly incredible. 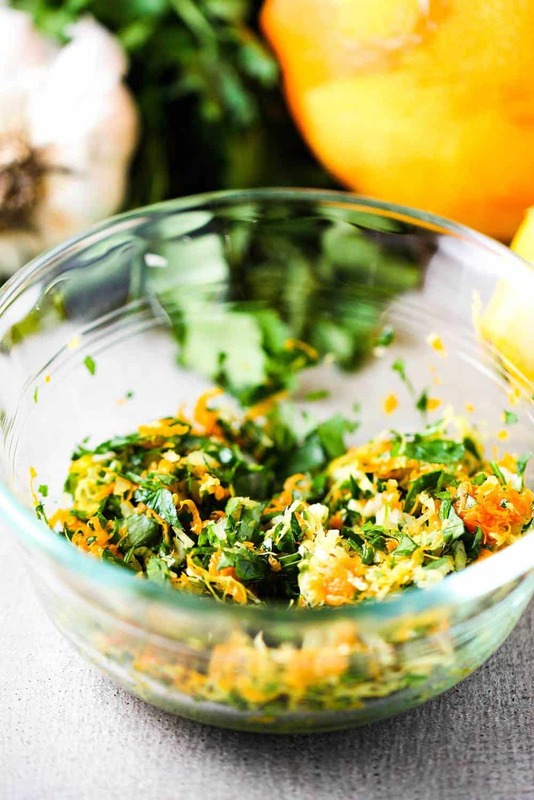 Be sure to top with the citrus/garlic gremolata…it gives it such a nice touch of color, but also a burst of flavor. It compliments the fork-tender veal and cooked vegetables perfectly. The bone marrow is also a real delicacy and an amazing treat. Another amazing low and slow braised Italian dish is Italian Pot Roast. Such an incredible roast with bold flavors! Serve this Authentic Ossoc Buco and bask in the praise you will receive from those lucky enough to dive into it! It’s that good. If a picture is worth a 1,000 words. 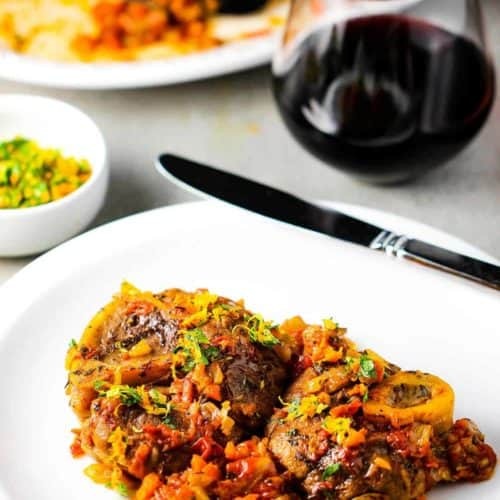 This Osso Buco is worth a 1,000 delicious bites. That doesn’t really make sense, but you get the idea. 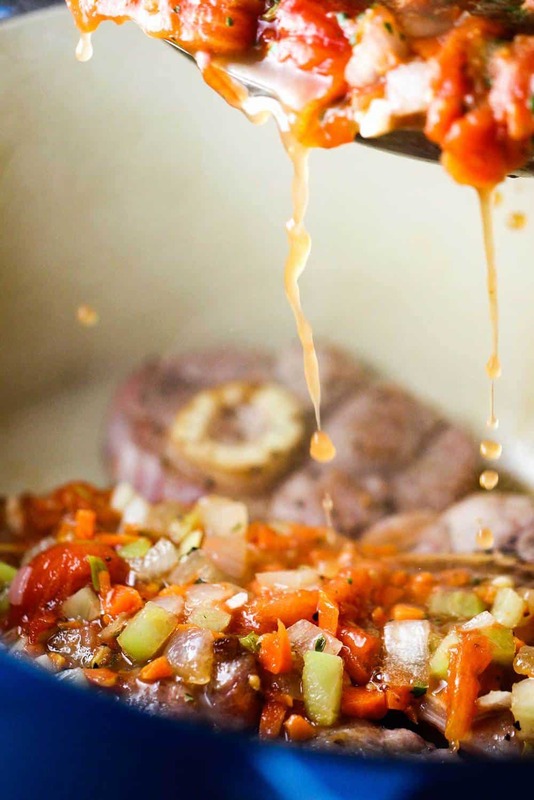 You gotta try this Authentic Osso Buco recipe! This Authentic Osso Buco is sublime. It's the classic low and slow technique that produces the most tender and flavorful veal. The sauce is incredible. 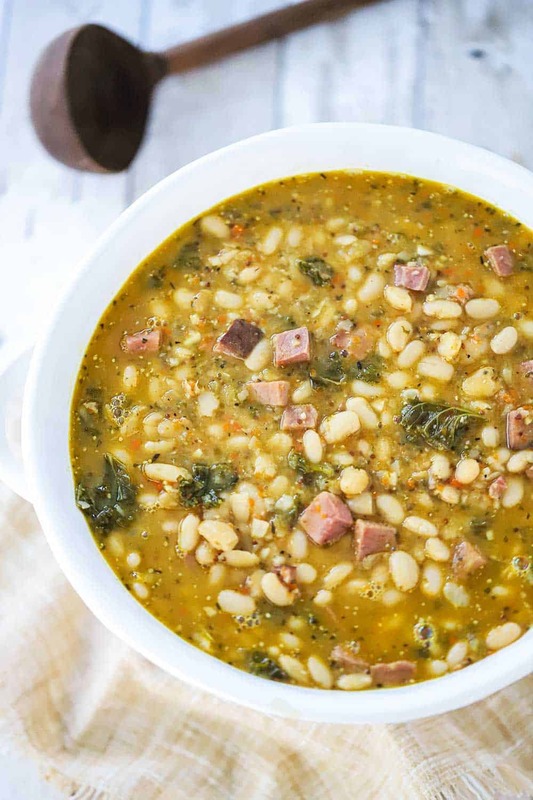 It's topped with gremolata, which gives an added burst of flavor and color. Amazing! Season the veal shanks all over with 1 teaspoon salt and 1/2 teaspoon pepper. Add the veal shanks and cook until browned on all sides, about 10 minutes. Remove from the pan and set aside. Add the onion and garlic to the pan and saute over medium-high heat until they start to turn tender, about 3 minutes. Pour in the wine and deglaze the pan, stirring and scraping up the browned bits on the bottom of the pan with a wooden spoon. Stir in the carrot, celery, tomatoes, stock, oregano, and thyme and bring to a boil. Transfer the veal shanks to a large Dutch oven. Pour in the vegetable mixture . Cover and cook until the veal is fork-tender, about 1 hours and 45 minutes. 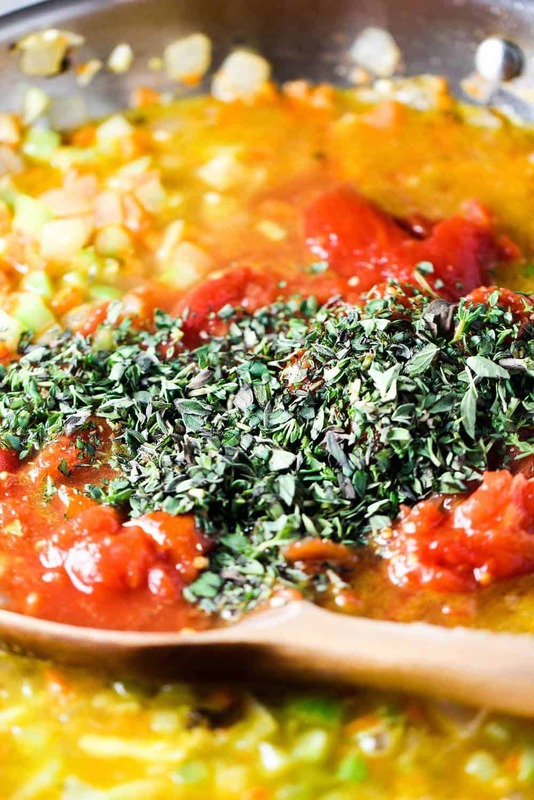 Shortly before the veal is done, mix the gremolata ingredients together in a small bowl. When the shanks are done, divide them among warmed plates, spooning the cooking liquid and vegetables over the veal. Garnish with the gremolata. Serve at once. This caught my eye on Twitter! My eye-talian hubs lurrrrves Osso Buco. When my home office was based at 1515 Broadway years ago there was actually a restaurant called Osso Buco in the West Village. They have since closed. I die. I am showing him this one because he has been dying to make it at home. We’ll take pics if we do and share! Happy weekend! We WILL take pics for sure! We have all sorts of shenanigans going on the next couple of weekends but it is officially on the list!! And I want to say Osso Buco was University place?? I might be mixing up locations because it’s been a while but I think it closed 3-4 yrs ago which is several years after I was there. Awesome! That sounds right about Univ. Place. I was thinking there was one up on Restaurant Row in the Theater District on 45th, I think. But I maybe getting that mixed up! Oh well! Have fun in Sunny Florida!! (so jealous!!). Stay in touch!